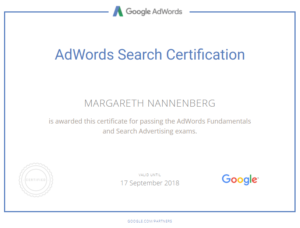 Google has recognized Margaretha Nannenberg (MarsConnects) as an AdWords certified professional, meaning that she has passed multiple assessments that assess her product expertise. She’s qualified to help you grow your business on the web using Google AdWords. Next PostHet optimisme in de digitale wereld.